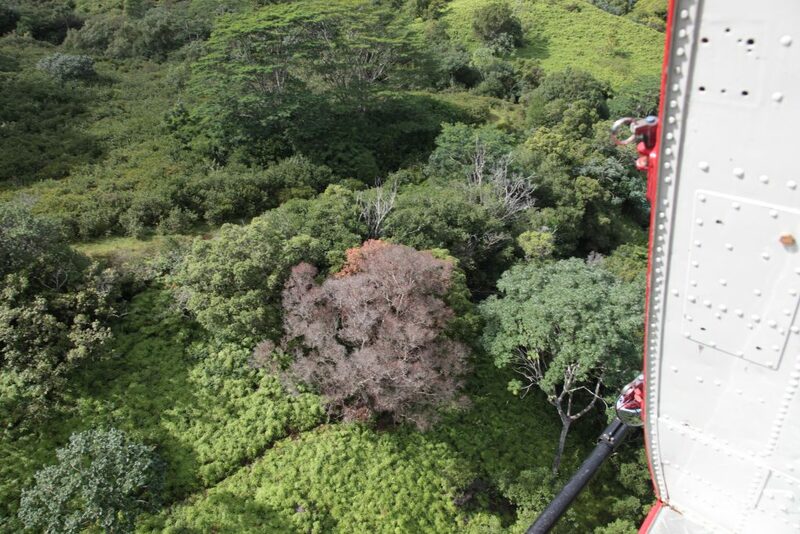 (Lihue)-Detection of Ceratocystis lukuohia, the more virulent of the two fungal pathogens causing Rapid ʻŌhi‘a Death (ROD), has now been confirmed in three trees on Department of Hawaiian Home lands parcel behind Kalalea Mountain on the east side of Kaua‘i. This first detection of C. lukuohia comes after the other pathogen resulting in ROD, Ceratocystis huliohia, was detected on Kauai in three distinct locations this past year. ʻŌhi‘a die for many reasons, although symptoms consistent with ROD include the sudden browning of leaves on limbs or the entire crowns of trees. The fungus is not visible on the leaves or the bark but grows in the sapwood just below the bark. The three trees that were sampled earlier this month stood out in a forest of green, because the entirety of the trees leaves had browned. Samples were then sent to the USDA Agricultural Research Service (ARS) in Hilo for the necessary laboratory testing that confirmed C. lukuohia in all three trees. A benefit for Kaua‘i is the hard-earned research conducted on Hawaii Island where ROD was identified more than four years ago. Hundreds of thousands of trees have died due to ROD on Hawai‘i Island, more than 90 percent due to C. lukuohia. Earlier this year, scientists at ARS described the two-different species of fungi that cause ROD as C. huliohia and C. lukuohia. Both species are new to science. The difference between the two pathogens is how they move through the tree and how quickly they kill. “The pathogen enters the tree through a wound; be it a broken limb, twig or, perhaps, a scuffed up exposed root. Whereas C. huliohia may take months to years to kill an ʻōhiʻa tree, C. lukuohia can kill a tree within weeks,” said James B. Friday, the extension forester with the University of Hawaii. The Kaua‘i ROD Working Group does not know exactly when or how the disease arrived on Kaua‘i-whether it was the result of human activity or on its own, e.g. via the wind. Once additional lab results and drone imagery are available, the rapid response team will consult with the ROD science team to determine what management actions should be taken. The C. lukuohia detection site is located in a remote area at 550-foot elevation. This forest location is comprised of a mix of native trees and plants like ʻōhi‘a, koa, hala, and uluhe that are being crowded out by non-natives such as albizia, java plum, strawberry guava, and octopus trees. Unfortunately, any loss of a native tree will give rise to the faster-growing invasives unless aggressive native tree plantings take place. “The Department of Hawaiian home lands supports the DLNR efforts to save the ʻōhiʻa on Kaua’i and we thank their team for their swift action to date. We will continue to monitor the situation and do all we can to assist. We encourage our beneficiaries and the public to follow the distributed guidelines to prevent more trees from becoming infected,” said Jobie Masagatani, Chairman of the Hawaiian Homes Commission.